My first attempt at a comic. I can see students having lots of fun using the comic strip generator. Graphic novels are very popular now and this approach might get some students writing in new ways. Thanks to ImageShack for the easy way to create fun comics. Image Chef has many ways to be creative. I appreciate that you do not have to register to use their tools. The above is a tribute to my excitement about learning 2.0 applications with a holiday twist. I wish all of you a very happy and safe Fourth of July! 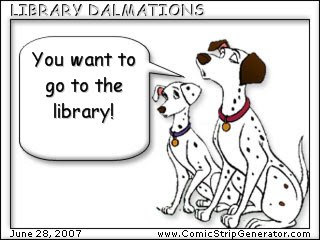 I want to go to the library (Google has almost relaced libraries for me), been a while, I go with my son now and then. The link for the cartoon maker is www.ComicStripGenerator.com (for those wondering). I think your cartoon is so cute. I can never think of funny lines to say. Do you think they have permission from all the companies that own these images to use them? I know, from past experience, that Disney is pretty agressive in defending their Copyrights. Very good question. I was assuming that they did but I haven't checked.